Burn calories, lose weight, and build muscles right in the comfort of your home using the Exercise Utility Bench from Marcy! Engage in fat-burning training and develop a bulkier physique by adding this high-performing gym equipment that's designed to let you have more efficient bodybuilding sessions! Perfect for both amateur trainers and long-time fitness enthusiasts, this exercise bench allows you to perform a full-body workout with its ergonomically-designed station so you can build and tone your body however you want. Made from sturdy powder-coated steel, reinforced with soft vinyl upholstery, this gym gear effectively resists the scratches and chipping that may result from heavy usage. This equipment lets you execute a variety of exercises to target the development of specific muscle groups within a compact space. You can do upper body strength work with dumbbells or a barbell and crunches for core work. It s also useful for switching between different types of workouts, including equipment-free sets. This bench supports a maximum weight of 300lbs. This utility bench has a compact structure that allows easy storage without taking up too much space. The steel framework is highly durable and is designed to facilitate maximum mobility while you perform exercises. Make each workout session more efficient by using this exercise gear that combines design and functionality! This equipment measures 51" (L) x 19" (W) 42" (H). Experience the benefits of an intense workout in a high-end gym without leaving your home. Use the Marcy Exercise Utility Bench and sculpt your way to a fitter and healthier physique! HEAVY DUTY CONSTRUCTION- Made with a durable steel frame that guarantees solid construction with contoured foam roller pads, boxed upholstery, and high-density foam providing an optimum amount of support and comfort to get the most out of your workouts! ERGONOMIC DESIGN -Unit features an ergonomically designed structure that is compact yet multifunctional. The equipment is shaped in a way that allows maximum mobility when performing exercises without taking up too much space in your home. COMFORTABLE ROLLER PADS- This fitness gear has soft foam roller pads for lower body comfort. With a high-density upholstery for an enjoyable strength-training experience, challenge your workouts while minimizing fatigue and physical exertion! ADJUSTABLE SEAT- The seat and back pads can be readjusted into different positions. Tailor the bench to your training and lay it in an inclining, declining, or flat position for both weightlifting and equipment-free exercises such as crunches and curls. "Build a healthier physique by working out right in the comforts of home with the Apex Exercise Slant Board JD-1.2! Featuring a heavy duty steel tube frame, this reliable gear is made of high-grade materials and reinforced with a powder-coated finish. Its sturdy construction offers superior resistance against scratches and wear and tear, resulting in durability for long-term use. This exercise board has a high-density backboard with foam padding that gives you the support to maintain proper form while working out. The extra-long board keeps your back and upper body in place, minimizing the risk of accidents and discomfort. Maximize your exercise plan and start your bodybuilding and strengthening sessions easily! Dedicated to providing every gym enthusiasts with comfort and convenience, this equipment is ideal for strengthening the upper body. Perform sit ups, crunches, and leg lifts Russian twists, or use free weights such as dumbbells and bumper plates with this board to tone your arms, chest, abs, core, and legs. The decline dumbbell press is an excellent move to focus on the lower part of the pecs. This utility weight bench also features 4 thigh and ankle roller pads crafted to promote leg stabilization while isolating upper body muscles for more focused muscle-building. Get the perfect addition to your home gym. Bulk up those muscles and lose some weight through home training with the Apex workout bench JD-1.2! This product is backed by a 2-year limited warranty, giving every user the quality they deserve. " Maximize your home fitness routines with the adjustable Apex JD 1.2 Slant Board, which will help you strengthen your abs and core muscles or work out your upper body. Suitable for a wide range of exercises, it offers an extra-long backboard and comfortable, adjustable foam pads that secure your legs and ankles. Other features include a high-density foam backpad with boxed upholstered construction for added durability, heavy duty 14 gauge steel tubing, and a powder-coated finish. It measures 52 x 12.5 x 22.5 inches when fully assembled. It's backed by a 2-year limited warranty. Why Choose Yoleo Wight Bench? YOLEO has our own manufacturers to create a collection that can provide an increase in overall endurance and strength. With the aim of producing the best weight bench available. YOLEO adjustable workout bench use high quality of materials to stand out in the inversion equipment competition. Start slowly and build up gradually. Give yourself plenty of time to warm up and cool down with easy walking or gentle stretching. Break things up if you have to. Exercising in short sessions a few times a day may fit into your schedule better than a single 30-minute session. Listen to your body. If you feel pain, shortness of breath, dizziness or nausea, take a break. You may be pushing yourself too hard. Other tips If any questions you met during excise, please contact with the seller firstly. People who have pre-existing conditions as high blood pressure, stroke, fused vertebrae, extreme obesity, detached retinas, or pregnancy should consult a doctor before weight bench. VERSATILITY ADJUSTABLE WEIGHT BENCH : YOLEO adjustable weight beach has 7 backrest pad positions to meet all you need when workout. The Foldable Workout Bench could be assembled simply as well as Easy To Carry& storage. FULL-BODY WORKOUT EXERCISE : The adjustable weight rack is ideal for working out and training on your chest, shoulders, back, abs, and more. COMFORTABLE & ERGONOMIC DESIGN : Comfortable high-density foam padding and seat secures body firmly and reducing muscle fatigue during workout. This Weight Bench Features a soft leather which is filled with dense foam padding so it is comfortable to do multiple exercises. SATISFACTION GUARANTEE : Order Today and Get 1 year Warranty on the Frame, 30-day Warranty on the Pads. Not satisfied with 100% unconditional refund. Sculpt your way to perfection with some assistance from the Fitness Reality X-Class Light Commercial Multi-Workout Abdominal/Hyper Back Extension Bench. This multi-purpose bench boasts a seven-position adjustable bench, four-position adjustable seat, and a preacher curl/leg development attachment that lets you work every core muscle group with a little bit of tinkering. From training to toning, this bench is an ideal tool, supporting up to 1,500 lbs (weight plates not included) and users up to six feet four inches in height. The bench, seat, and rollers are all padded with foam. Faux leather upholstery provides a comfortable surface. Transport wheels provide mobility. Dimensions: 64L x 28.8W x 35H in.. Frame built from tough steel. 7-position angle adjustment. Preacher curl/leg attachment included. Padded with foam, upholstered in faux leather. Supports up to 1,500 lbs. Dimensions: 64L x 28.8W x 35H in. 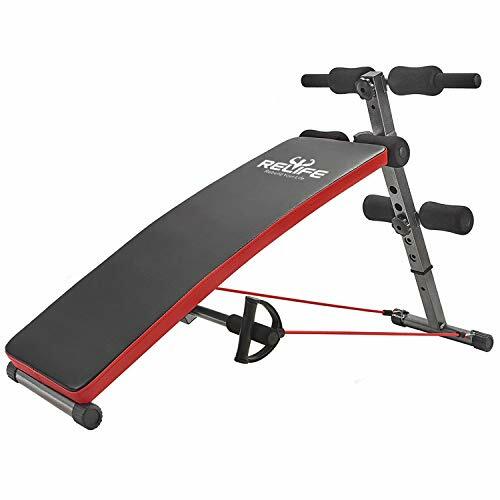 The Stamina Ab/Hyper Bench gives you terrific core strength, ripped abs and powerful back muscles. Work your upper and middle abs in four crunch positions ranging from flat to a 30 degree decline. The pull of a pin quickly and easily adjusts the angle of the bench to increase or decrease your workout intensity. Brand: Stamina | Manufacturer: Stamina Products, Inc. Durable Construction: Flat bench has a solid design, which made of high grade steel and high density foam firmly supports body. Weight Capacity: Fitness bench features a sturdy frame and holds up to 260LBS, safety and heavy duty, free worry about the security problem. Foldable Design: Slant board is household fitness euipment, foldable design help to save space, the folding size is 50.4x22.1x8.3inch. Ready to try dozens of exercises on this single multi-functional bench? 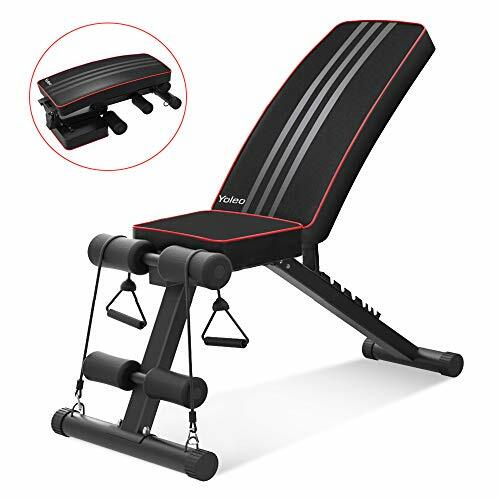 Built from durable, high-strength steel, this bench from Finer Form delivers the sturdy durability you need to build your core, arms, legs and abdominals, all in one convenient piece of equipment. Use it as an adjustable sit-up bench to strengthen your abs and oblique muscles. Grab some dumbbells and use it as a flat bench for flies and chest presses. Or use it as a decline bench to work your lower back, hamstrings and core. 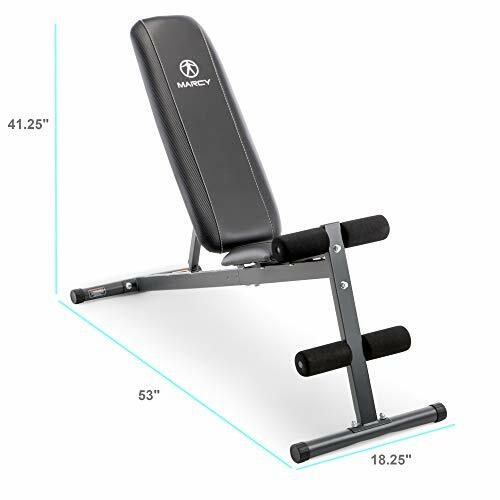 Built with 2" x 2" Steel frame construction, 15-gauge steel and 2-inch high density cushion, the Finer Form Abdominal Bench can support 660 lbs of real weight capacity, and user height range of 5' to 6'4". With 7 thigh support cushion height adjustments, 4 foot rest adjustments and 1 flat and 3 decline bench adjustments, you can be sure that the bench will conform to your body and support you through even the hardest workout routines. Product Benefits Heavy duty triangle steel frame provides added stability and durability. No wobbling or shaking no matter how much you lift. Maximum weight capacity is 660 LB The thickness of our steel frame is 15 gauge. Traditional benches are between 11-12 gauge The thick, dense 39x13x2 inch cushion is comfortable, yet still provides the support and durability you need, workout after workout. The exterior leather stands up to whatever grueling exercise routines you can put it through Assembly required Manufacturer warranty - 100% Satisfaction Guaranteed Product Dimensions Net Weight/Gross Weight: 38.8 LB/43 LB Weight Capacity: 660LB Package Size: 43.7x14x9 INCHES Product Size: 52x19.6x27-31.7 INCHES Pad Size: 39x13x2 INCHES About Finer Form Finer Form is aiming to bring the best quality exercise equipment to your home gym with the most affordable price possible. If you have any questions about our products and workouts, need replacement parts or simply chat, please do not hesitate to contact us. All-IN-ONE MULTI-PURPOSE BENCH - Designed for multiple workouts, targets most major muscle groups, shape your abs, back, chest, glutes, hamstrings and core. GYM-QUALITY CONSTRUCTION - Made with high grade steel and scratch resistant powder-coated finish to stand up to the hardest exercise routines. STRONG AND STABLE DESIGN - No wobbling or shaking! Extra supporting tubes form a Triangle frame structure, which handles up to 660 lbs. and provides stable support for variety of workouts. 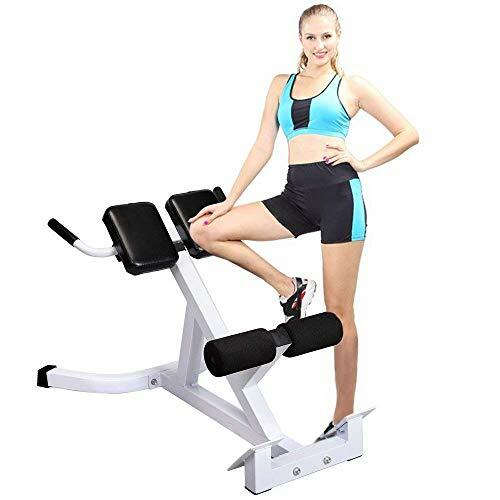 This versatile Body Power multipurpose bench gives you ultimate versatile at home workouts with adjustable positioning. Pair with your existing exercise equipment such as dumbbells, barbell weights, resistance bands, exercise ball, exercise roller, exercise sliders, for effective workouts in your apartment or home. STURDY STEEL BACK SEAT SUPPORT FRAME and adjustment rail with a 650 lbs. maximum weight capacity. Multipurpose weight bench for all levels and workout styles. BUILT IN TRANSPORT WHEELS with easy-grip handlebar to maneuver easily in and out of cages or storage. Glides easily in between reps, circuits, and around the home. Stretching is essential while you aim to enhance overall fitness. That's why you'll need this Ferty-1 Back Hyperextension Bench Roman Chair! It helps strengthen your lower back, spine and abdominal muscles, as well as improve blood circulation and relieve pain. The bench is set to a precise angle for ultimate conditioning. Soft, thick cushions provide maximum support and keep you comfortable during the workout sessions. Foam rollers will keep you securely in place while you exercise. Heavy-duty steel construction with coated finish adds to the durability of this fitness equipment. Click and order now! Versatile Equipment: Focus on back, hamstrings, glutes, and abs with the same bench.. It helps strengthen the lower back while targeting the glutes and hamstring muscles for superb workout. Design For A Full-Body Workout: The Ferty adjustable bench is anall-in-one piece of gym equipment for a variety of fitness exercises. Thisutility bench could help you strengthen the muscles in your chest, shoulders, back, abs,and more. Humanization Design: It equipped with ample padding and two-foam leg holders for your convenience and maximum comfort. This all new Ironmaster utility bench was developed to add features our customers have asked for over the years after extensive development. This low profile bench is finally the perfect height (just 17.2 tall in flat position) with our revised locking ring shape and geometry. We kept everything that is great with the original Super Bench and took it to the next level! Still compatible with most of our popular bench attachments (Crunch Situp, Dip Handles, Chin Up, Hypercore), this will be your new favorite bench. (Not compatible with the Cable Tower due to the height difference.) 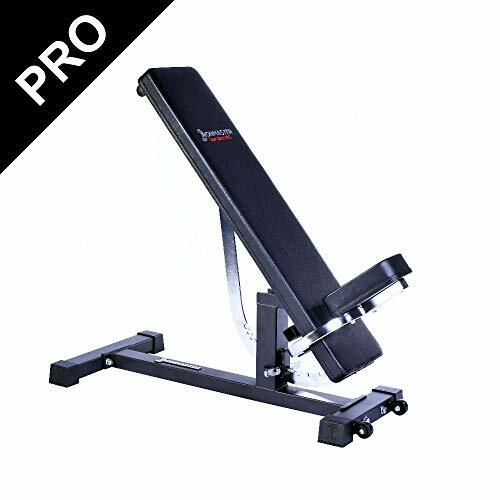 The Super Bench PRO fully adjusts to suit your workout needs: Flat - Incline - Decline - Upright. Fully adjustable, our weight bench has 11 lock out angles and can be used in a variety of workouts with the addition of different Ironmaster attachments. 11 lock out angles: Inclines, Declines, Flat and Upright. 0, 5,10, 20, 30, 40, 50, 60, 70, 75, 80 and 85 degrees. Powder coated black texture frame with chrome components. High density pad and stitched vinyl upholstery. New pull pin and locking knob hold attachments with greater force. The included 2 position incline seat fits users of different heights. 1000 lb rated, 11 & 12 gauge super strong steel frame. (600 lb rated for incline/upright positions.) Unique adjustment ring with foot lever adjust operates from both sides and locks up tight! Patented design. Incline seat follows backrest pad at any angle so it will always be perpendicular unlike other benches where the seat can have a shallow angle allowing the user to slide off. Ultra stable strong platform in aII positions yet is easy to lift and move but also includes wheels. (You can mount the wheels on either end of the bench) Bench weighs 65 lbs. 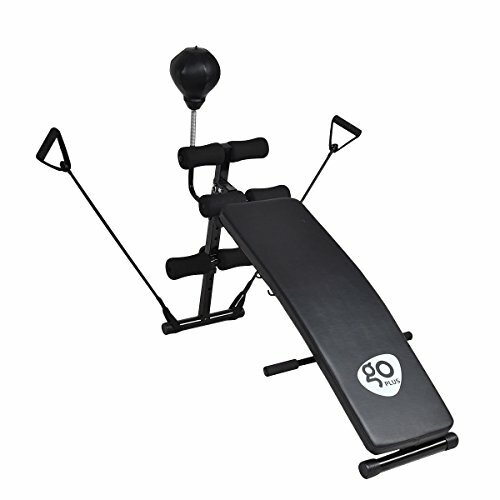 Accepts a growing list of optional attachments like the Crunch Situp, Dip Bar Handles and Chin Up Bar. Ships pre-assembled except for feet so you can start lifting in just a few minutes. NEW UPDATED DESIGN WITH LOW PROFILE DESIGN. Still offers all the great Ironmaster Super Bench features, but with a new lower 17.2" flat height geometry for the perfect fit. QUICKLY ADJUSTS TO 11 ANGLES WITH PATENTED FOOT LEVER. Quickly adjusts from decline to upright from either side of the bench. SOLID WARRANTY AND SUPPORT WITH OVER 35 YEARS OF PROOF. 10 year structural warranty and 1 year on upholstery. Ironmaster is always at the ready to help if needed. MULTI FUNCTIONAL, PROVEN DESIGN. Ideal for dumbbell training, barbell, machine or cage work. Perfect for use with dumbbells, smith machines, cages or racks. Check out all the amazing attachments available - more than any other bench in the world! SUPER STRONG 1000 LB RATED. Heavy duty, stable bench platform, but still easy to pick up and move, very space efficient design. Wheels included. Get the abs you've been wanting for years with this bench. Scientifically designed for more efficient workout. It's heavy-dusty steel frame is multi-height adjustable, it features dual ankle pads and non-slip rubber end caps. Combined with regular exercise and a sensible diet, it may help you tighten your abs and shrink your waist. Don't hesitate to buy it! Includes anti-stress speed punching ball to exercise your coordination and reaction velocity. Adjustable bench offers four different positions. Heavy duty vinyl cushion pad seating surface with dense foam padding. 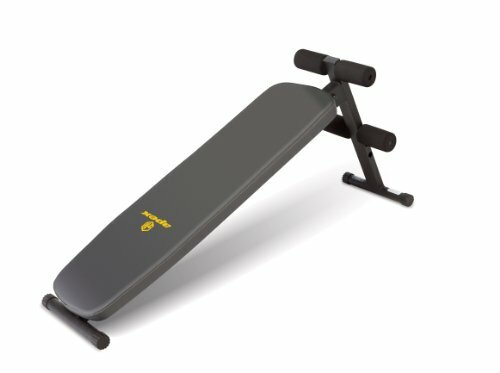 Goplus weight bench is turdy and durable, and it has non slip rubber coated end caps. Contoured shape foam rollers ensure safe and comfortable workout. All Body Exercise Equipped with a speed ball and 2 pull ropes, it can not only for abs, but also good for stretching, leg workouts, twists, back sit-ups and pushups. You can exercise different parts of your body with one tool. Comfortable Cushions and Safe Design It features a flat inclined design and with the padded rolling cushions on back which perfectly support your body and eliminate back and neck strain. It makes you comfortable and safe when exercise. Four Adjustable Positions This ab bench offers four different positions to ensure you get the right abdominal crunch workout. A good trainer for people to exercise with different degrees. Solid Material This Abdominal rocket equipment is made of heavy duty thick steel, very strong and stable. The largest weight capacity is 220lbs and will basically meet most people's exercise needs. Easy to Assemble and Store Clear and brief instruction make it much easier to assemble. And it can be stored under bed when you don't use it. It is not only suitable for gym, but it also can be used at home, office.